Neutral colors, stainless appliances and brushed nickel hardware are used throughout the interior to create a modern feel. The home has everything you’d expect in a new construction, but the shiplap walls, industrial fixtures and unique finishes add some unexpected interest. Surfaces manufactured by GlassEco and installed by World Granite, LLC. 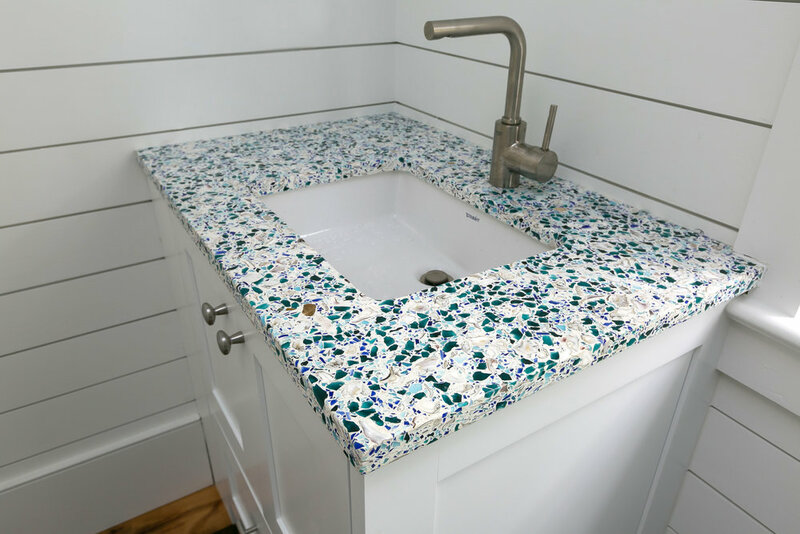 GlassEco manufactures recycled glass countertops that can be customized to suit virtually any design aesthetic, and our surfaces can be used in a variety of interior and exterior applications (bars, table tops, pool surrounds, shower walls and more). A visit to our North Charleston shop is the best way to fully explore design options, but GlassEco Surfaces can be delivered anywhere in the contiguous United States. Visit our gallery page for more design inspiration, or contact us to schedule a complementary design consultation. When newlywed bloggers Morgan and Sean went shopping for their first house in 2016 they had DIY dreams of a completely custom (and very coastal) kitchen. The couple already had some home improvement experience (you can read all about Morgan’s condo transformation on the Charleston Crafted blog), but a kitchen would be their most ambitious project yet. Morgan met with GlassEco Owner and Design Consultant, Elizabeth Fisher to arrive at just the right mix of recycled glass and shells for Morgan’s custom countertops. 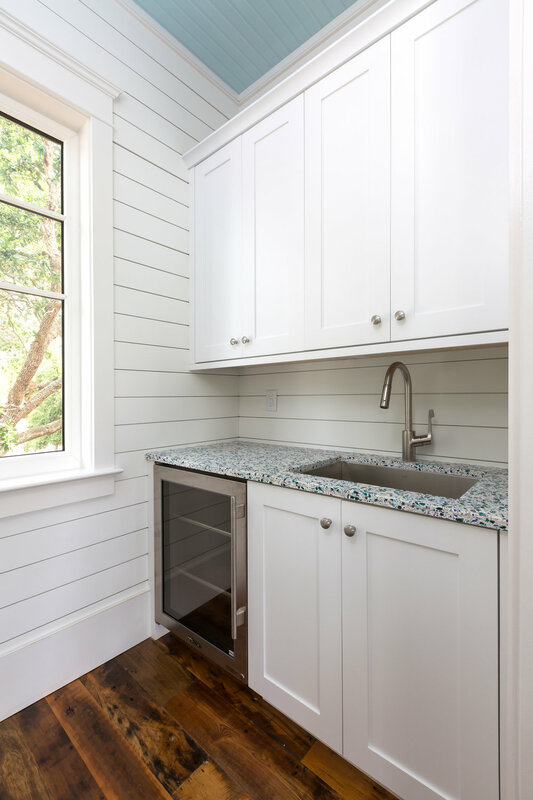 Checkout Charleston Crafted’s countertop post for an in depth description of that process, and visit the GlassEco Process page to learn more about the design possibilities of recycled glass. In addition to installing custom recycled glass countertops, Morgan and Sean scraped ceilings, removed wallpaper, took down a wall, painted cabinets, installed a tile back splash and renovated a pantry. 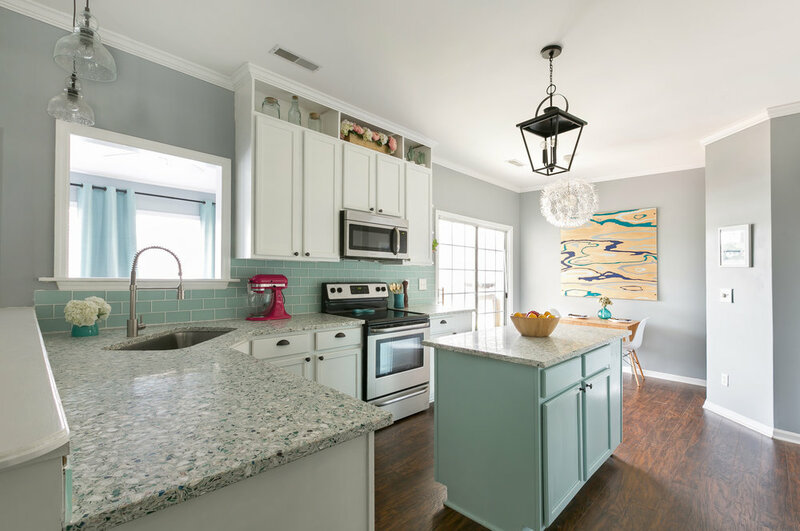 You can get all of the kitchen renovation details in their Coastal Kitchen Reveal post. 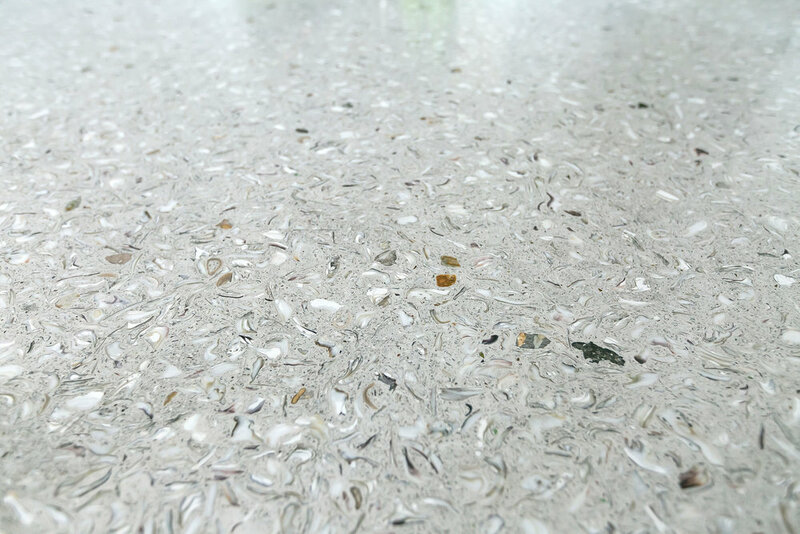 GlassEco manufactures recycled glass countertops for interior and exterior use. These surfaces can be customized to suit virtually any design aesthetic. A visit to our North Charleston shop is the best way to fully explore design options, but GlassEco Surfaces can be delivered anywhere in the contiguous United States. Visit our gallery page for more design inspiration, or contact us to schedule a complementary design consultation.